There is a lot of information flying around, both online and offline about autism. Most of the information about the condition is incorrect leading to confusion, and eventually, more suffering to the affected. Sometimes parents even hide their autistic children, and since it needs lots of constant care, immediate caregivers and especially parents are unable to go out and earn a meaningful living. What many communities around the country should know is that autism is not a curse. It is not a sin and it is not caused by witchcraft. It is a medical condition just like any other and needs to be treated as such, and is mostly treated through therapies. Autism Spectrum disorder, also known as autism, is a neuro-developmental disorder first apparent in infancy or early childhood. Key characteristics of the disorder include impaired development in social interaction, impaired ability to communicate, and a restricted repertoire of interests and activities. In autism, the brain is unable to process sensory information normally. As a result, these children are unable to respond adequately to stimulation and initiate social behavior towards family, friends, and peers. There is no effective medication or cure for autism but occupational therapy helps improve the quality of life. The role of therapy is to help the children to be able to regulate the information received and their behavior thereafter through use of various activities. Last week I spent a day at St Georges Primary School where they have a class for autism and hearing impairment and this (April) being the autism awareness month, I got to learn quite a bit about the condition. needs class is a Class from St Georges Public Primary school in Ruiru specially set out for kids with special need that is autism and hearing impairment and discovered the numerous challenges that these kids go through. Stigma – autism is still not accepted as a normal diseases by the society. Parents of children suffering from the condition are often stigmatized. Some children are often not accepted in society. They are excluded and left in pain and despair. Inadequate health services – there is still scanty information about autism in the medical field in most hospitals around the country. This has led to parents engaging in desperate searches for treatment or assistance of their kids. Some have even opted for traditional medicine or traditional healers, not because they want to, but because they want to try and see what works. Gaps in service provision – children living with autism require therapy to facilitate their learning of vision, perception, speech and even movement. There is still a lot that needs to be done or invented in the field to fully help the kids. Financial burden – most families with the affected children come from very needy backgrounds. They always use the little they have on the treatment of their children with most of the time left with no money. As mentioned earlier, the majority of the parents are from a very needy background. They cannot afford to take the kids for therapy at Kenyatta National Hospital. They really need financial assistance. Well-wishers have stepped in and the kids are getting therapy monthly but the parents are hardly able to contribute their half of the therapy fees, which is 10,000 shillings. Due to the challenges the kids face, they need a full time caregiver in addition to the teacher to help them with basics such as eating and toiletry. Currently, the therapy class is ill equipped to meet the standard for therapy the kids so much greatly need for a chance at a quality life. The kids do not have a specialized teacher and are only assigned a primary school teacher. They all attend the same class despite the age difference. At the end of the day, what came out clearly was that these kids need all the necessary help in terms of finances, services and any other assistance that will help them feel whole, appreciated and part of the society. 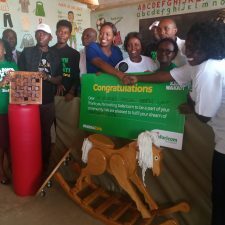 Safaricom’s Ndoto Zetu initiative is determined to make sure that these kids are helped through the partnership with the school and other well-wishers by giving items that will help the trainers in the trainers.